Grammy-nominated Irish American super-group Cherish The Ladies have just celebrated a milestone anniversary of 34 years together since their first concert on Jan. 5, 1985. The Ladies are not resting on their laurels, however; they are making the final preparations for their 2019 “Heart Of The Home” tour, which will make a stop at the Towne Crier on March 29. “Heart Of The Home” is a riveting live show that will have the audience singing, clapping and tapping its feet, all the while being regaled with hilarious anecdotes from Cherish The Ladies founder and front woman Joanie Madden. The “Heart Of The Home” live show is a wonderful blend of the old and the new, the ultimate celebration of the musical culture and traditions of Ireland, with Cherish The Ladies performing music from their latest album of the same name. Irish songs, lively jigs & reels and heart-wrenching slow airs transport the audience on a musical odyssey. The Ladies take centuries-old music that has been passed down from generation to generation and make it their own with tasteful new arrangements and talented renditions. The live show also showcases catchy new melodies, inspired by Ireland’s rugged Wild Atlantic Way and almost certain to become traditional staples in their own right. 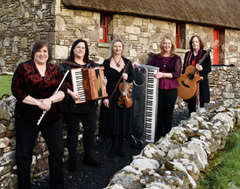 Each song has been carefully selected and highlights the musicality and versatility of this outstanding ensemble that includes Joanie Madden (flute, whistles, harmony vocals), Mary Coogan (guitar, banjo, mandolin) Mirella Murray (accordion), Kathleen Boyle (piano, harmony vocals) and Nollaig Casey (fiddle). The tour is also joined by Special Guest and Co. Clare songstress Kate Purcell, along with world class Irish dancers; 5-time World Champion Co. Kerry native David Geaney and others. Joanie Madden formed the all-female super group in New York City in 1985 to celebrate the rise of extraordinary women in what had theretofore been a male-dominated Irish music scene. For more than three decades the talented musicians that are Cherish The Ladies have performed at venues all over the world, and have been invited guest artists at The White House and the Olympics. They have recorded a staggering 17 critically acclaimed albums. Joanie Madden was the Irish American Writers & Artists Eugene O’Neill Lifetime Achievement Award winner for 2018, joining an illustrious group of past recipients such as Malachy McCourt, Pete Hamill, John Patrick Shanley, Judy Collins and Brian Dennehy. Cherish The Ladies level of artistic, historic, and purely enticing entertainment is unlike any in its genre. As their reputation and admiration from both fans and critics alike continues to grow, Cherish The Ladies blazes forward into another decade of music making.